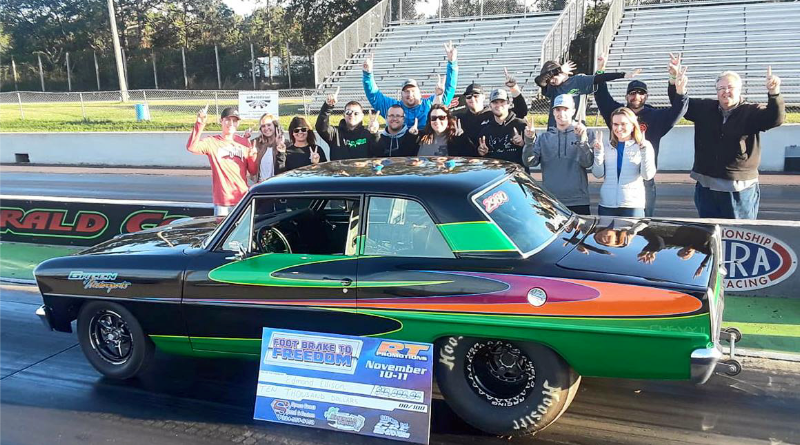 Each week DragChamp ranks the best sportsman racing stories and performances from around the country. The Top 10 list recognizes the weekend warriors who travel the country looking for their next big victory. To perform at a high level in the ultra-competitive world of sportsman drag racing racers must sacrifice so many things in life and work tirelessly on their combinations all for a trophy and a check. DragChamp was created to bring increased media attention to the sportsman racer and highlight their stories and outstanding efforts. 1 – David Rampy wins 100th NHRA National Event – We’ve covered Rampy’s quest for 100 over the last few months and he finally got it done at Pomona. Rampy collected his 100th Wally by defeating Doug Lambeck in the Competition Eliminator final round. Rampy joined an elite list of only two sportsman racers to win 100 national events, Dan Fletcher is the only other racer with more than 100 wins. Frank Manzo did win more than 100 national events but he was more of a professional racer in the Top Alcohol Funny Car class. Rampy won his first event in 1983 and has continued to perform at a super high level for 35 years. Salute to David, his crew chief Barry, and his family on their tremendous accomplishment. For more race coverage of the Auto Club NHRA Finals click here. 2 – Edmond Ellison runs himself in the final round – Just a few short weeks removed from his $10,000 footbrake victory at the BTE Southern Footbrake Challenge at Holly Springs Motorsports, Edmond stepped it up another notch by taking winner and runner-up honors at the Footbrake to Freedom event at Emerald Coast Dragway this past weekend. Driving Josh Green’s beautiful Chevy II, Edmond ran through the field eventually running himself in the final round. Both of Edmond’s recent victories came at the expense of some of the top footbrake competitors in the country. 3 – Steve Williams wins NHRA Super Comp World Championship – After a late season charge that culminated with a runner-up finish at the NHRA Division 7 Lucas Oil Drag Racing Series event at The Strip in Las Vegas, Williams surged to the top of the Super Comp points standings. Going into the last race of the season, the Auto Club NHRA Finals, Steve held a 20 point lead over Don Nichols and a 57 point lead over Mark Grame. With Williams out of opportunities to add to his points total, he was forced to wait and see if Nichols or Grame would pass him. Nichols fell in round one but the drama lasted until Sunday afternoon as Grame, needing to make the final round to pass Williams, had made it to the quarterfinal round. With a bye on his ladder in the semifinals all Grame had to do was light the lamp against quarterfinal opponent Tony Helms and he would be the champion. Grame fell to Helms in their matchup handing the championship to Williams. It was a fun and stressful Super Comp points chase this year. Congratulations to Steve and his family on their NHRA World Championship. For more Super Comp event coverage, click here. 4 – Jeff Taylor goes to back-to-back national event finals – Four-time NHRA World Champion Jeff Taylor avenged his final round loss at the Toyota NHRA Nationals at Las Vegas by winning his 46th NHRA national event Wally at the Auto Club NHRA Finals. In addition to his latest victory, Taylor finished third in the Stock Eliminator national points standings. For more Stock Eliminator event coverage, click here. 5- Pat Osmundson wins Super Pro national championship – The NHRA Summit Racing Series national championship run-offs took place at the Auto Club NHRA Finals and Osmundson drove his dragster to the win after defeating Jeremy Hancock in the final round. Osmundson, Pasco, Wash., caught a lucky break in the first round when he posted a 1.199 reaction time for the win after his opponent was -.005 red. Osmundson took full advantage of his lucky round and drove all the way to the winner’s circle. 6 – Nelson Belot Jr. wins Pro E.T. national championship – Belot, Dalton, Mass., started eliminations with a huge win over Division 4 bracket finals master Jake Howard and followed it up with another tough match up with Sasha Hoefer. After two big wins, Belot paired against Dustin Loynes in the final and had his hands full. Loynes was perfect trip-zip at the tree to take a .03 advantage but misjudged the finish line to go -.014 under his dial handing the breakout win to Belot. 7 – Brian Hendrickson wins Sportsman E.T. national championship – Hendrickson, Hamilton, Ohio, defeated Garret Hoefer in the first round and Earl Talley in the second round to move into the championship final. Hendrickson used a huge .005 to .058 reaction time advantage in the final round to capture the national championship over Brent Erickson. 8 – John Markham wins E.T. Motorcycle national championship – Markham, Bowling Green, Ky., was on kill at the Auto Club Finals as he used posted a .023 package in the first round and a .016 in the final round to collect the national championship. Markham defeated Jeremy Hicks in the final round. 9 – Chad Webber wins first Wally in his first final round – Webber, Kingman, Ariz., collected his first NHRA Super Comp Wally in his first national event final round. The final round victory capped off a great year as Webber also took home the Division 7 Super Comp championship. On Sunday, Webber used a perfect 8.900 in the semifinals to stop Division 4 super-class star Steve Collier. In the final, Webber combined a .013 light with a 8.916 to take the easy win after final round opponent Tony Helms missed the tree posting a .064 reaction. 10 – Roger Kato wins his first Wally – Roger Kato, North Las Vegas, Nev., proved that the third time is a charm as he collected his first national event Wally in his third final round appearance. Kato posted a perfect 9.900 in the semifinals to earn a berth in the final round. The run was Kato’s third dead-on pass of the weekend. Kato defeated Greg Ventura in the final round after Ventura ran under the index with a 9.897. That’s a wrap on this week’s Top 10 list. Follow DragChamp daily for the latest drag race results from the world of sportsman drag racing. If you don’t see your event or track results listed on DragChamp, tell your track operator or promoter to contact garydon@dragchamp.com. Please share, comment, and like.